Publications describing the era popularly known as the Renaissance often compartmentalise the period, focusing on art, history or literature (etc). Among the most difficult of undertakings by authors writing about the Renaissance is to attempt a work that coalesces more than one field of study. Although such titles often explore these related fields in brief excursions of detail, the overriding focus usually is reflective of the author's training and field of study. It is not too surprising therefore, to encounter Michael Fried writing about the Renaissance and Baroque in manner more suited to a modern art critic, or Martin Kemp, methodically examining linear perspective or Leonardo attributions in a style that hints at a degree of scientific training. It is difficult to argue that any single approach is superior. Fried's detailed observations on viewership can be as revelatory as Kemp's astutely structured presentations mixing art and science. For the reader (and reviewer) the challenge lies in understanding the author's intention, and whether they have communicated their message in a satisfactory manner. In writing this book, I am not claiming special expertise. Just the opposite. I have a generalist's role, assembling evidence and synthesizing a narrative that makes sense of the interaction of mathematics and the arts in the Renaissance. That Galileo drew upon mathematical traditions in the arts in his scientific work is the motivation, and sometimes the substance of this narrative. I will move from Galileo himself to the many legacies that he inherited, from classical mathematics to traditions in the arts, aiming to build a picture of Galileo's intellectual world, the world of his discoveries. The above is clearly stated on page 6. As a non-specialist reader, this frank introduction was very useful - as it set the tone for the rest of the presentation. It also flags an increasing potential for distortion in the facts presented. Would Peterson "follow the [intellectual] streams back to their sources," as he promises to do in the prologue? It is interesting here to delineate between these "intellectual" sources and historical sources. As a professor of physics and mathematics, Peterson seems more concerned with the mathematical "correctness" of the ideas he discusses than the reliability of their source. This would be immediately jarring to any historian reading this book, whose primary focus would be to identify the relevant textual sources and make an assay of their reliability. In an art historical sense, a similar analogy comes up in discussions about themes in an artist's work. Although factual inconsistencies are often found in such presentations, this does not invalidate the entirety of the thematic observations made in such pieces. Subsequently, in Peterson's recounting of Galileo's life and work, he has given little consideration to the integrity of the sources consulted. As Peterson attempts to "synthesize a narrative", we must wonder if this is actually possible without a level of specialist expertise. As impressive as any narrative can be, it should never be accepted as a complete truth, but a presentation assembled by an author to suit their own philosophy. Does this mean we should abandon, or even avoid texts such as Peterson's? This is entirely at the discretion of the reader. An argument can be made that such presentations are useful from a dialectic perspective. Not unlike the dialogues written by philosophers since antiquity, the discussion created by these syncretic efforts can be wonderfully demonstrative of the more deeply hidden concerns in writing about history. In the prologue, Peterson states that his book can easily be read in sections, hence those interested only in the interplay of mathematics and the arts can jump straight to these sections. Being more familiar with the concepts in this section of the book, I found Peterson's attempt at narrative synthesis a reasonable effort, but not without caveats. He quotes several primary accounts, from Dürer to Piero della Francesca - though again only shows a vague consideration of the reliability of these accounts. This type of awareness does not come natural to most authors, let alone readers - but is a core component of the activity of an historian - which is perhaps why I was not greatly distressed to read oversights such as "In 1545 artist Giorgio Vasari published his Lives of the Painters." The frontispiece of the first edition published by Lorenzo Torrentino of course verifies the publication year as 1550 (noting Julian Year, Florentine date). 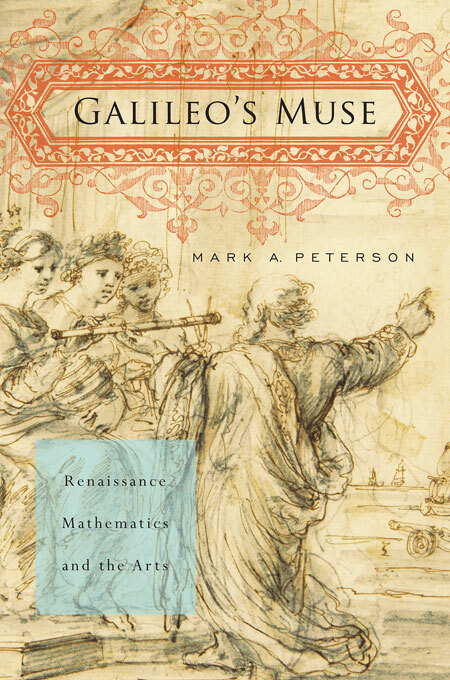 Overall, Peterson's section on mathematics and the arts presents an adequately boiled down history of the key events and proponents of the period. That others have done it in more depth does not require specialist knowledge to ascertain, but the key elements are there - a description of the development of perspective and its transmission, its great debt to Euclid's Optics and a mention of a related text that was translated from Arabic to Latin. The roles of Piero della Francesca, Alberti and Pacioli are described in overview. Peterson does go into the finer points of some of the mathematical concepts of perspective, particularly those outlined by Alberti, which could be argued was not necessary in a generalist presentation. Exploring these concepts may have been better achieved using the same text but with a more visually interactive medium than a line drawing in a book. Had Peterson's content instead been part of an online presentation or web article, it may have been more viable. For a more methodical account examining art and science in the Renaissance (and beyond) I would recommend Professor Martin Kemp's The Science of Art - though even this admittedly can be heavier going for those first exploring linear perspective. In this sense, Peterson's effort can be useful as an introductory overview that could be used to expand and compare the different types of texts written on perspective - which range from the overtly mathematical, to the more narrative and philosophical efforts of writers such as Hubert Damisch. For yet another angle on this book, I would also like to point readers towards this interview with Peterson by Sarah Luehrman Axelrod, a graduate student of languages and literature at Harvard University. I believe it is demonstrative of the type of discussion such a book can evoke across many fields. In fact, Sarah's comment on Galileo's Muse being a text advocating interdisciplinary discussion of the study of the Renaissance is perhaps the overriding theme here. The richest description of any period of history will come from many voices in dialogue. Peterson, M. Galileo's Muse. Harvard University Press. 2011. "The richest description of any period of history will come from many voices in dialogue." Very well put, Hasan. And so true. Many thanks for the feedback Vicky - I really wanted that to be the final thought of the review. These subjects have been traditionally been handled in such a monolithic fashion - particularly since the 19th Century, that something of this wonderful dialogue has been lost. Since antiquity and well into the Early Modern era discourses on art, history, science and philosophy (etc) were presented in dialogues and commentaries as well as treatises. There is a degree of hubris involved in thinking that any one approach can account for the many facets of any discussion. Technology will continue to work to make access to resources and collaboration easier - we look forward to a time when publications with a range of interdisciplinary inputs are the norm, rather than the exception they currently are. Thanks very much for this illuminating review, H! Does Peterson have anything to say about the kind of basic mathematics education that most educated Florentines would have had (and, most importantly, the merchant classes)? I ask this because, in his discussion of art and maths in "Painting and Experience in Fifteenth-Century Italy," Michael Baxandall makes a big point of emphasizing this general level of mathematical competence. Specific figures (Piero, etc.) are mentioned within the context of this larger cultural context. Sample quote: "The skills that Piero or any painter used to analyse the forms he painted were the same as Piero or any commercial person used for surveying quantities" (p.87 of my edition). At least in my (decidedly non-Renaissance!) mind, Baxandall's brief text is perhaps still the most influential account of the relationship between art and mathematics in Renaissance Italy.... well, Florence. Based on your review, I think that the historical inaccuracies in this book would bother me too much! I'll think I'll stay away from this book, just for my own peace of mind. Perhaps if it appears in an online forum (as you have suggested), then I'll be more prone to look at it. Like Ben, I am wondering if Peterson referenced Baxandall in his book. Since this publication is geared toward a general audience, were there footnotes or any kind of bibliography included? I'm not sure how geared towards a general audience this effectively is. Even considering Peterson's stated generalist intentions, he seems most comfortable when discussing the mathematical side of topics presented, be they in painting or astronomy etc. A "general audience" presentation would not necessarily go into this type of detail. There are superscripted refs in text and endnotes at the back of the book, citing sources. Baxandall's famous book is not cited in the section on painting, though this isn't unusual given Peterson is drawing on more complex/mathematically oriented texts. Baxandall's account is best described as a gateway text for those approaching the topic from an art history angle. It is a nice overview for introductory teaching purposes, though the study of perspective is of course a field of inquiry in its own right. In this the work of JV Field and the NGA Anthology volume Piero della Francesca and His Legacy are recommended resources on Piero and the role of mathematics in his painting. It's also worth adding that in many texts the use of perspective focuses on the Renaissance and does not travel back into antiquity to explore the visual systems used in Ancient Greece and Rome. In 2011 a fascinating article was published in this direction by Stinson at the American Journal of Archaeology, Perspective Systems in Roman Second Style Wall Painting.